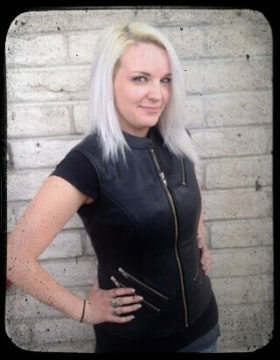 I am Ashley, I ride a Sportster 1200, I work the floor and the Sewing & Embroidery department at Renegade Classics. I love bikes and bike fashion. When you come to the store, my goal is to help fit you with the best equipment for your size and taste. Do not hesitate to ask me all the technical questions you need: I know our products very well and I am always happy to give you an answer. Tell me if you need special patches: we embroider all kinds of patches, even complex designs. We sew on any new patch while you are at the shop, and with our new sewing machine we can even set your patches on jacket sleeves. Pretty cool.